One of the less noticeable changes ushered in with iOS 10 was the introduction of extensions for Apple Maps. Just like the Photos extensions, it lets apps get their hooks deeper into Apple Maps and appear as options that look like integrated parts of the app. Here are the best ones you can use so far. By default these extensions aren’t enabled at the same time as the apps are installed. Go to Settings, tap on Maps, then toggle the switch for each app that you want to enable the extension for (it’s probably a good idea not to overdo it). They’ll then magically appear in Apple Maps the next time you open it. Alternatively, you can enable them from the prompts inside Maps itself (behind the Ride tab in the case of Uber, for example). OpenTable has appeared in most Apple Maps extensions demonstrations to date, and that’s because it’s so useful. It lets you book reservations at restaurants when you’ve found somewhere suitable you want to get a bite to eat. The app now supports more than 37,000 venues worldwide. If you’ve found a place that looks like it’s in a good location, tap on it on Apple Maps to bring up its card at the bottom (with details such as opening times). If the restaurant supports OpenTable, you’ll see a Reservations button that brings up a booking form right inside the app. Google Maps includes Uber now, so it makes sense that Apple wants a piece of the cab-hailing pie for its own app. Get Uber installed on your phone, enable the extension (as above), and it shows up on a Ride tab when plotting a route from one place to another. Uber itself needs no introduction, letting you call a taxi from anywhere, but you might not know the service recently added the option to book rides in advance. It continues to grow globally too, so if it hasn’t been available in your part of the world before, check again. Yelp is another one of the big location apps to have an Apple Maps extension at this early stage in the life of iOS 10. 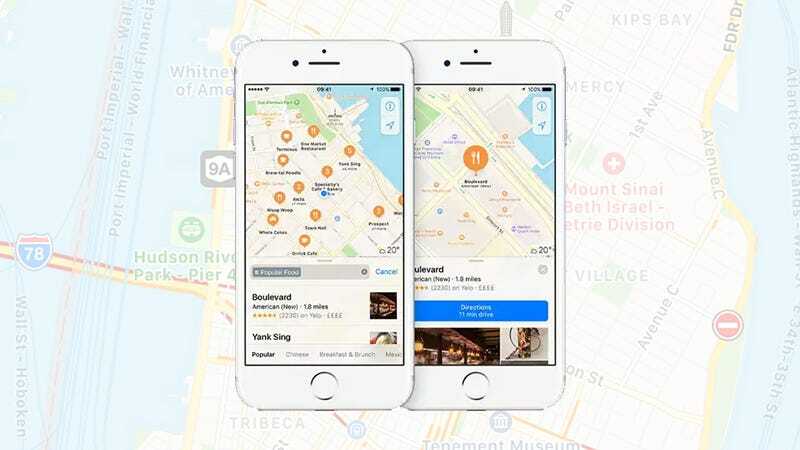 Yelp reviews are already displayed on place details cards inside Apple Maps, but by enabling the Maps extension, you can access reservation bookings as well. As with OpenTable, not every restaurant has signed up for Yelp reservations, but you’ll see a button next to the Directions one if you can make a booking through Apple Maps (it’s easy to see how crowded this might get with too many extensions enabled at once). Where Uber goes, Lyft usually follows (or vice versa), and sure enough there’s an Apple Maps extension available for Apple Maps too. If you have both this and the Uber extension enabled at the same time, they appear on top of one another when you’re getting a cab. Find your destination in Apple Maps, set where you’re traveling from, and under the Ride tab you can see the Lyft section showing your estimated fare and how long you’re likely to have to wait for a ride. It’s a handy way of quickly comparing Lyft and Uber fares, at least.